Thank God it is Friday! (TGIF) This appellation is very common among workers, students and even private individuals who look forward to a reassuring break from their usual work routine once it is Friday. It is most needful to ask why God is being thanked because it is Friday. More so, we should also try to know the origin of the name “Friday”. All these will help us to appreciate this very day for what it represents in our lives. The name Friday comes from the Old English “frīgedæg” which actually means the day of the English goddess of love known as “frigg”. In Latin which is the mother of the Romance languages, Friday is known as “dies Veneris”. Now “Veneris” comes from “Venus” which is the name of the Greek goddess of Love and fertility. In all, Friday can be called Love’s day or the day of love. From the explanation above we can clearly see that Friday is Love’s day and the highest expression of Love was displayed today on the Cross by our Lord Jesus Christ. It is on account of this that our Lord Jesus said in the Gospel of John (15:13) that “No one has greater love than this, to lay down one’s life for one’s friends”. This is indeed what this Friday stands for. 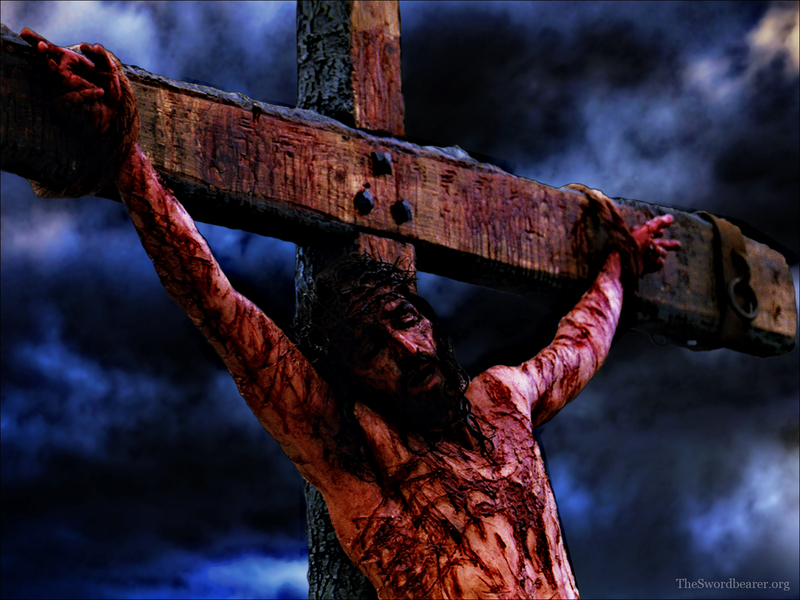 So we thank God it is Good Friday because on this day we received the highest expression of God’s love. On this day, we received superabundance of God’s love. On this day God gave us His most precious possession, namely His Son. Faced with some situations in life some people often reassure themselves of a better time by saying: “it is well!” There is no day that is as sublime as today to say boldly that IT IS WELL. The whole creation had been waiting for this day to come. This is the day that marks the triumph over the devil through the death of Jesus Christ on the cross. Hence, this Friday is good because our debt had finally being paid and fully. We are no longer owing; Jesus Christ our Lord by his death on the Cross had cancelled the debt we incurred through sin. St. Paul brought this out very vividly in his letter to the Colossians (2:14) where he established clearly that our unfavourable records were cancelled by Jesus Christ on the Cross of Calvary. The central object today is the Cross. It will thus be worthwhile to dwell more profoundly on the Cross of Calvary. There are two prominent platforms in the whole of the bible: the tree at the middle of the Garden of Eden (Gen. 2:16-17) and the tree of the Cross of Jesus Christ (I Pet.2:24; Acts 5:30; 10:39; 13:29). The Cross functions in undoing the powers and effects of the tree at the middle of the garden. The tree was attractive to the eyes but its fruits led humanity to disconnection from God. The cross on the other hand had no attraction (the only fruit is the one crucified on it, Jesus Christ). It is despised by all but through it humanity is redeemed and reconnected with God. Hence our Lord Jesus Christ would say: “when I am lifted up I will draw all people to myself” (John 12:32). This simply means that the tree at the middle of the Garden of Eden dispersed all people from God, but the Cross of Jesus Christ in the middle of sinners (represented by the two thieves; crucified on his left and right) brought humanity back to God. Humanity failed God by the tree at the middle of the garden and humanity got redemption by the tree of the Cross at the middle of sinners. Satan seduced humanity by the old tree but on the platform of the cross (the new tree) Satan was defeated. By the old tree God pronounced curses and human nature was wounded, but by the new tree humanity received blessings and healing. By the old tree of Eden, Adam and Eve were chased out but through the new tree we received divine convocation (Jn 12:32). The Cross from all indications is the symbol of our victory. No wonder then we have today the ceremony of the veneration of the Cross. The Cross is not merely a heavy load, it is not merely a symbol of suffering and death. Above all these, it is a plus sign, it is a salvific ladder, and it is also a warfare arsenal. Having explored all that was done for our sake, the pertinent question would be; “How can we repay the Lord what he did for us?” One thing that comes to mind at this point is that we should endeavour to suffer with Him. We should be ready to walk the walk with him. In a certain Parish, an elderly Priest was leading the Stations of the Cross on a Good Friday along a rocky and rough road beside the parish. At the third station which marked the first fall of Jesus Christ, the Priest inadvertently struck his foot against a piece of rock and felled face-down and had his face bruised. The processing parishioners were moved by empathy at the sudden fall of their elderly Priest and spontaneously, emotional shouts were heard from among the people. The next challenge was if the priest should continue leading the Way of the Cross or hand over to another person. On his part he would have wished to discontinue, but upon remembering and pondering upon what Jesus Christ steadfastly underwent on the Way to the Cross for us, he dismissed the idea of stopping and continued with a renewed strength till the end; though still wearing a bruised and blood stained face. During the shooting of the life changing movie “The Passion of the Christ” by Mel Gibson (2004), the man who acted Jesus Jim Caviezel confessed that Jesus Christ must have suffered more than we actually imagined. Mel Gibson wanted to make the movie as real as possible so he tried to use the actual things used by the Roman Soldiers at the time to punish criminals. For flogging they used a whip (flagrum) which had several strands on which are attached pieces of bones and irons. The Jewish flogging then was thirty-nine times (2nd Cor. 11:24) but the Roman soldiers had no limit. When they flog the bones and irons would be dug into the body and they would draw the whip letting out blood. During the movie they used the same whip but covered the body of Jim. However it happened once that the elastic covering shifted and the whip landed on the bare body of the actor. The impact was so much that the shooting of the movie was suspended to allow Jim Caviezel to recover. From the instances we have above, it will be worthwhile for us to be patient in our suffering (Romans 12:12). And as St. Paul made us to know, if we suffer with Christ we are sure that we shall also be glorified with him (Romans 8:17; 2 Tim.2:12). Have a reassuring and highly blessed Good Friday!